This small panel was formerly in the French collection of the Duke of Blacas de Aulps, entering the Thyssen-Bornemisza collection in 1956. It was included in the 1958 catalogue of the Collection where it was attributed on the basis of Friedländer’s opinion to Hugo van der Goes. 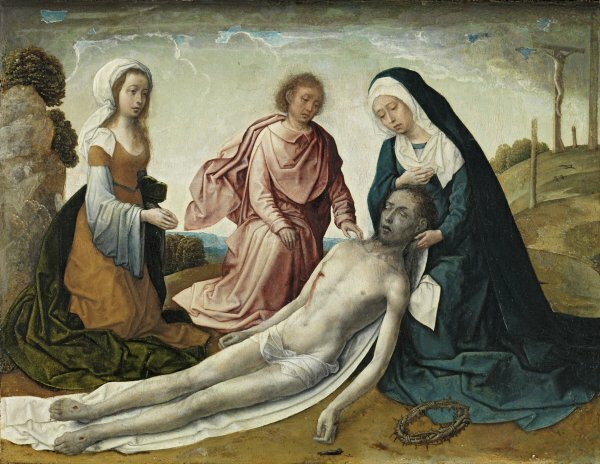 The attribution to Juan de Flandes was suggested by Winkler and incorporated into the 1969 catalogue of the Collection, while Elisa Bermejo had already included the panel in her monograph on Juan de Flandes, dating it to around 1500. It is not known whether this panel was intended as an independent work or originally formed part of a larger composition. It is based on a lost painting by Hugo van der Goes known through various copies such as the one in Granada in the Instituto Gómez Moreno. Juan de Flanders borrowed the principal group of Christ and the Virgin, but made changes to the figures of Saint John and the Magdalen. He also modified the landscape that acts as the setting. This dramatic episode, in which the Virgin expresses her suffering through the moving gesture of her hand raised to her beast, is located at the foot of Mount Golgotha on which the artist includes part of the Crucifixion with the Good Thief still hanging from his cross. This element, which is not to be found in Van der Goes’ original, is counterbalanced on the left by a rock that harmonises the composition, leaving a central area of background with a view of hills and trees that leads the eye into the far distance. The figure of the kneeling Magdalen and Saint John are awkwardly inserted into the pictorial space, a defect particularly evident in the pose and proportions of the latter. Santiago Alcolea tentatively suggested that the striking and unusual broken tree trunks on Mount Golgotha might refer to Christ’s role as proclaimed in three passages in Isaiah. He also pointed to the presence of these roughly broken trunks in other works by the artist such as a Lamentation in a private collection.An important precedent for this element is to be found in another Lamentation by Geertgen tot Sint Jans in the Gemäldegalerie, Vienna. With respect to Van der Goes’ composition referred to above, Juan de Flanders modified some elements to conform to his own style and models, for example the figure of the Magdalen is similar to various figures in the Polyptych of Queen Isabel the Catholic. In addition, the central group in the present panel was re-used by the artist, albeit modified to suit a different format, for the predella of the Saint Michael Altarpiece in Salamanca.